Welcome back to another week of Old-Fashioned Friday! 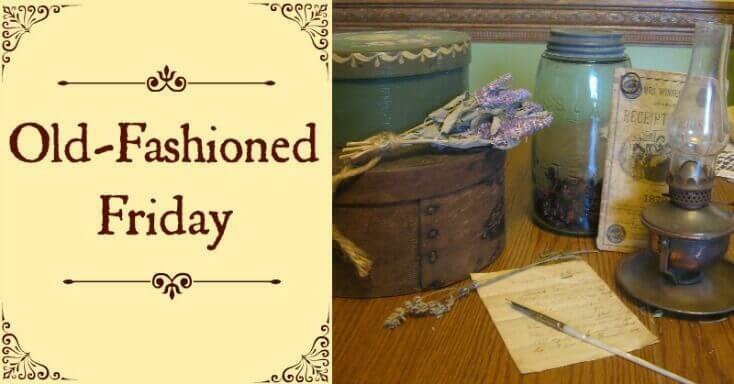 Old-Fashioned Friday is a weekly gathering place for bloggers to share their ideas, tips, discoveries, etc. about real food, natural health, and old-fashioned living. Just like the quilting bees and front-porch gatherings of the “good old days,” Old-Fashioned Friday is a spot for bloggers and readers to stop by for a visit to greet one another and to learn new things. Each week I will be featuring the three most-viewed posts from the previous week, so make sure to check back for next week’s carnival to see if you were featured! I’ll also be pinning to my Pinterest boards as much as I can all of the posts that follow the guidelines. 1. Keep it old-fashioned. Please link only to posts that fit in with the areas of real food and natural living. That could include: recipes, herbal remedies, holistic health, homesteading, DIY projects, household tips, food politics, gardening, etc. The possibilities are endless! Please no links to giveaways, though. 4. Link to your post, not your homepage. Make sure you link to the URL of your specific post, not the home page of your blog. It will make it much easier for us all to find your post! Good evening, Lori. Thank you for hosting the party. Have a wonderful Memorial Day weekend! Hi Lori and thank you for hosting Old-Fashioned Friday! Today I share my experience trying four new spring foods. It’s always fun experiencing new tastes and expand my usual diet to include new foods. I’ve been inspired to prioritize eating seasonally more and decided to host a blogger event to celebrate all things summer food. I’d love for you to participate. The link with details is at the bottom of my post. http://ow.ly/x91m6 I thought it would be a fun way to connect like-minded advocates and kick off the summer season! I hope you decide to join us. Have a great Memorial Day Weekend! Thanks for hosting! I’m sharing a post on why we LOVE school uniforms!